This is the ultimate action-packed tour of Portgual—ideal for those with limited time who want to see as much as possible, while traveling in comfort. You won’t have to worry about booking transport, as hotel pickup, drop-off, and transfers are included. Travel between dispersed sites with a guide to provide commentary. 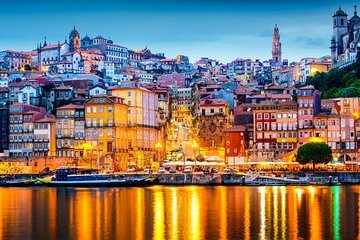 Highlights include a wine tasting in Porto, the canals of Aveiro, Costa Nova, Douro, Braga, and Guimarães. All three trips were wonderful, especially for those travelers who do not want to drive a car. In a short time you can visit the most famous places in the north of Portugal. Thanks especially to our guides / drivers. We both (my sister and I) enjoyed everything. We enjoyed an awesome three day tour of Porto and the surrounding cities of Braga, Guimaraes, Aveiro, and the Douro Valley. The three days were so enjoyable because of our tour guide, Milena, who works with Meridian 4people. She has such a wealth of historical knowledge and her personable presentations were delightful.The tour exceeded our expectations in terms of travel comfort, knowledge gained, introductions to area foods and wines, and impressive cultural structures. As outlined in the promotion package, the tour offered a good variety of places to visit such as wine cellars, cathedrals, terraced landscapes, medieval castles, etc. This is a very worthwhile package if you wish to see all the highlights of the region in a short period of time.